Switzerland hosted the European Championships in 2008 with Austria, although they have struggled on the continental stage each time they have qualified. Coach Vladimir Petkovic will be hoping to lead his talented crop of players to the knockout stages, becoming the first man to do so in the nation's history in the process. Although Switzerland has yet to win a trophy in an international competition, the country has always been at the forefront of world football. That is because both UEFA and the game's world governing body, FIFA, have their headquarters in the country. Switzerland have only missed one major tournament since 2004 - the Euro 2012 finals in Poland and Ukraine. Under veteran coach Ottmar Hitzfeld, they reached the second round of the 2014 FIFA World Cup, where they lost in extra time to eventual runners-up Argentina. The nucleus of Hitzfeld's team has provided a solid foundation on which successor Vladimir Petkovic could build. Not that they started well. Switzerland lost their opening two qualifying matches, to England and Slovenia, before putting together a run of four successive wins to secure qualifying momentum. In total, Switzerland won 7 of their 10 games, losing the other three and ultimately finished as group runners-up behind England, five points clear of third placed Slovenia. As at the 2014 FIFA World Cup, the attacking onus fell on theshoulders of Xherdan Shaqiri. the 24-year-old was their leading marksman during qualification with four goals, one more than strikers Josip Drmic and Haris Seferovic. Solid experience in defence was provided by Juventus' Stephan Lichtsteiner and Hamburg's Johan Djourou - with more than 140 caps between them - plus the promise of Fabian Schar from Hoffenheim. Lichtsteiner had earned approving reviews from all around Europe when he helped Juventus reach the 2015 Champions League final, in which they lost to Barcelona. Gokhan Inler, Valon Behrami and Gelson Fernandes plus the inspiration and goals of Shaqiri delivered similar solidity and consistency in midfield. In attack, 19-year-old starlet Breel Embolo is definitely the player whose value could skyrocket with an impressive set of performances in France this summer. 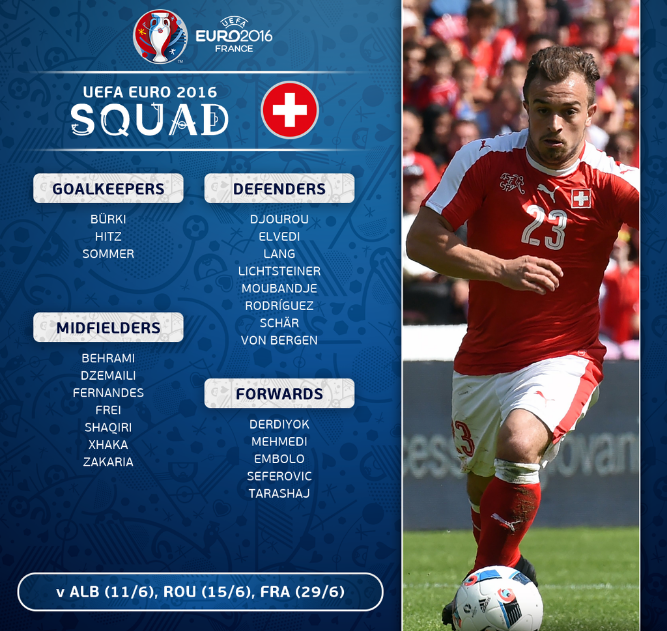 Another measure of Switzerland's tournament know-how becomes clear when you consider that Djourou, Lichtsteiner, Behrami and Fernandes were all members of the national squad when they co-hosted the European Championships with Austria in 2008. This time, across the border in France, they could benefit from "near-home advantage". Everybody is expecting France to top Group A and Switzerland to comfortably follow them through to the second round. From there, a meeting with Poland is likely, who I've tipped to make it through as runners-up in Group C with Germany. This would be a tie that could go either way dependent on how the marquee players perform on the day, but I feel that Robert Lewandowski's prowess would make all the difference for Poland. 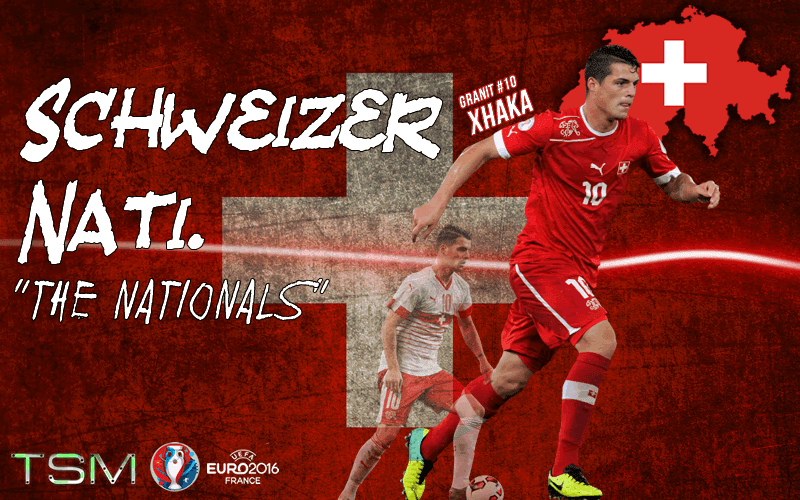 Euro 2016 Preview Series: Switzerland.